This exotic pair of insects has a hefty hive full of cash jackpots, and they are inviting you to party with them! Click here to play! Will you join them and enjoy the exciting winnings on offer? Love Bugs is a joyful 5-reel slot played over 9 thrilling pay lines, where the more lines opened allows for great winning combo options. The Lady Bug and Love Bugs are both Wilds and can be substituted for any other symbol on the reels except Scatters. Hearts are Scattered and can show up anywhere on the reels in order to earn payouts. However, if you are looking for the biggest cash payouts, spin up 5 Venice symbols on an active pay line for 5000 times your original wager. 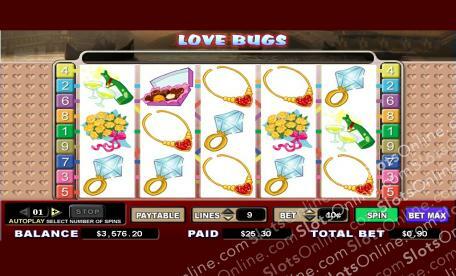 Love Bugs is a wonderful slot that’s sure to satisfy your romantic side. The Heart is Scattered and can appear anywhere on the reels in order to a payout. Land two or more to win every time, up to 100 coins. The Lady Bug and Love Bug are both Wild, and can substitute for any other symbol, except scatters, in order to complete a winning combination. The exciting Bonus Round is triggered when both Wilds appear correctly. Land the Lady Bug on Reel 1 and the Love Bug on Reel 5 to be sent to the lucrative Bonus Round.